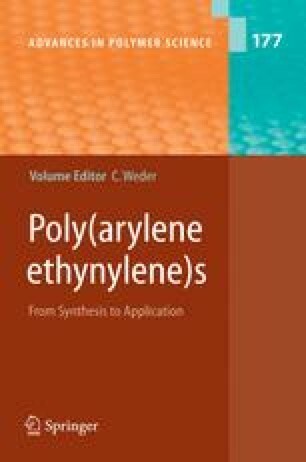 Poly(arylene ethynylene)s (PArEs) have been used in recent years as effective transducers for a variety of sensing purposes ranging from organic molecules such as methyl viologen and TNT to biological analytes. Their superior sensitivity to minor perturbations is fundamentally governed by the energy transport properties resulting from the extended conjugation of the polymer backbone. An understanding of the underlying principles of energy transport allows the design of sensors with greater sensitivity and specificity. Pioneering work with methyl viologen as an electron-transfer quencher demonstrated that connecting receptors in series amplifies the sensing response compared to that of individual receptors. Since then, factors such as the electronic and structural nature of the polymers and their assembly architecture have proven to be important in improving sensory response. In this review, we present an overview of works to date by various groups in the field of PArE chemosensors and biosensors.